John Ovenstone has taken control at Tayport. In-coming Tayport manager John Ovenstone is planning on leading the club back to the very top of the junior game. 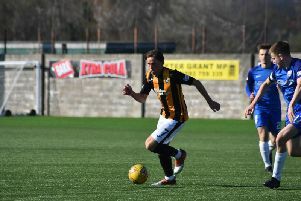 The former East Fife defender was confirmed on Saturday as being the man who’d replace the departing Dave Baikie. Baikie made the tough decision to stand down before Saturday’s postponed fixture with Parkvale. The Canniepairt club was swift to appoint a successor, with Ovenstone given the role immediately. And now the hard work starts for the former East Fife defender to guide the club to Super League safety and beyond. He said: “My priority is staying in the Super League this season and, longer term, we will strive to get Tayport back to the top of junior football. Ovenstone, who will remain as a player, will be assisted by former Stenhousemuir striker Steve Kerrigan. “When I’m on the park, I’ll be a player, not a manager, so I need to have someone in the dugout that I respect and trust,” he said. “Steve fits that bill perfectly. “He’s very passionate about football and we share the same philosophy about how the game should be played, so I’m delighted to have him on board. “To have the opportunity to manage a club of Tayport’s stature, in the Super League, was one I felt I had to take.